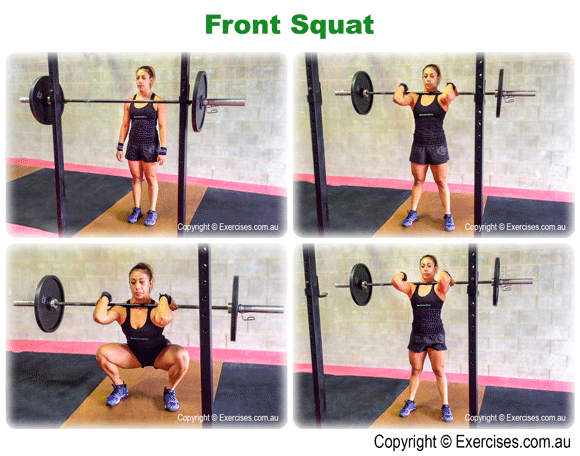 Front Squat is a great exercise for isolating the quadriceps muscles. There is secondary emphasis on the hamstrings, gluteus muscles, shoulders and upper back. The front loaded position of the Front Squat reduces the involvement of the lower back but requires the core muscles to remain tight in order to maintain the nearly upright position of the upper body and to support the lower back. Adjust the height of the Power Rack to a level where you will need to drop a little to place the barbell on your shoulders. Take a wider than shoulder width grip on the bar. 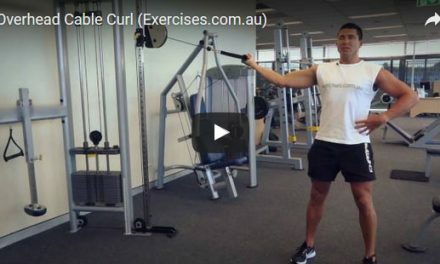 Grab the barbell with your hands open wide which allows you to better elevate your elbows. The elbows must be parallel to the floor. Once the bar is firmly on your shoulders, take two steps back. Your feet must be shoulder- width apart and slightly angled out to lessen shearing forces on the knees. Tighten your core, inhale then initiate the Front Squat by bending at the hips then the knees. Continue the descent until the crease of your hips is lower than the crease of your knees. At the bottom position of the Front Squat, your knees must be tracking over your toes. Remember to keep your elbows up and parallel to the floor. Squat up by pushing through the floor with your heels, extending the knees then the hips until you get to the top position. Placing the bar on the shoulders with your elbows down is a common problem when trying to put more control on the weight. When your elbows are pointed down, more pressure is placed directly on the shoulders. And when you get to the bottom position of the Front Squat the tendency is for the bar to pull you forward and lose balance. Another common mistake is doing a Front Squat on the front of your toes. This causes the heel to elevate and reduce stability and balance.